Good evening everyone. I’d been looking forward to Sunday evening for quite a few days. Throughout the latter part of last week, the weather forecast was suggesting that the skies would be clear for a good deal of the afternoon and through into the small hours. The only issue being, work would get in the way on Monday morning. So, in plenty of time, I set the scope up outside whilst it was still light, and then came to wait until darkness. I used that time to get a few more ideas on what I could target for the evening. Following on from first light for the SBT on the 21st, I decided that I would quite like to get back to the constellation of Leo. I also decided that Gemini would be a good area to explore. Armed with my notebook, Telrad chart and pocket atlas, I headed out to the garden and sat in the dark for a while before putting the Telrad on the scope and getting everything lined up. To Leo. I wanted to make sure that what I had seen during first light of the scope was true. I still couldn't quite believe what else was visible through the 12” mirror in comparison to the 6”. I made a note in my book about the seeing. Though not brilliant, it was still the clearest sky around here for quite a while. My first target of note for the evening was NGC 2903 which is a spiral galaxy of magnitude 9.6. I found the target quite easily using the Telrad. However, I couldn't really see much structure if any. A faint fuzzy it certainly was. Around my observing point, there were various lights being switched on and off by the neighbours as people began to settle down for the evening. I think without this minor interference, I could have seen a lot more. The back garden does actually get very dark once people have settled down and gone to bed. Unfortunately, I didn't have the luxury of a late night so it will be a target to revisit in better conditions. Next in Leo, I paid a visit to M65 and M66. They appeared exactly as I remembered them. Both easily visible in the same FOV through the 32mm EP, but again without too much detail involved. Then, I thought it would be worth a quick view of a target visited many times before, M44 The Beehive Cluster. It was pleasing to see it again and is certainly much richer with the aid of the 12” mirror. Having spent a bit of time looking around Leo, I paid a quick visit to Gemini and the cluster of M25. A pretty target that really filled the EP. Not as bright as M44, but still very well defined. I decided to take a seat for a while, and under red torch light, flicked through the atlas and just gazed around the sky spotting as many stars as possible in the constellations of Leo and Hydra. Sometimes, I find it just as relaxing and enjoyable and when it comes to finding targets, a bit more knowledge always helps! Then, it was time to look at the constellation of Ursa Major. Nice and high in the sky, the pocket atlas shows many targets that I've tried for but not managed to locate in the past. M63 was on the list, technically in Canes Venatici, but kind of in the right area of the sky. I’m afraid to say again, probably because of local light pollution and poorly adapted night vision, the target was nothing more than a grey smudge for me. But, it’s definitely whetted the appetite for a revisit under darker skies. While in that locality, I nudged the SBT on to M51, the Whirpool Galaxy. For me, this was probably the best target of the night. Not really appreciating what it looked like from a photo, I made a note in my book that I could see two distinct light spots very close to each other. They didn't look like two completely independent objects given the light areas that seemed to join them. In my mind, I recalled an image I have seen in a magazine of what looked to be a spiral galaxy almost consuming a neighbouring galaxy. I wondered if this is what I was looking at. I was really pleased when I verified what I thought I saw when I came back indoors and saw a similar image on stellarium. What a cracking sight that was. I felt like I was on a bit of role, so I decided to go for two more targets in Ursa Major before calling it a night. The first was M109. In stellarium, it’s referred to as the Vacuum Cleaner Galaxy, a new one on me. Because of its proximity to the star Phecda, I found it very easy to locate, but quite tricky to distinguish. I found it easier to nudge the scope a little so Phecda wasn't in the field of view. This meant that M109 was now towards the edge of the field of view, but it meant that the comparative brightness of the star wasn't detracting from the image of the galaxy. Finally, a little further nudge towards Merak brought the final target into view, M108, the Surfboard Galaxy. In the Telrad charts, it was given as a magnitude 10 object. The first mag 10 object I’d been able to find in my short hobby time as an observer. In the faint grey colouring of the galaxy, I thought I could make out a very small single pinprick of light that stuck out quite well. I assumed this to be the core of the galaxy. So all in all, a very enjoyable and exciting observing session that brought a raft of new objects to my tick list. Whilst I’m sure the scope is capable of so much more again, especially with some mods including a shroud and possibly flocking, it really is demonstrating its brilliant abilities under my ‘back yard’ conditions. As you might have noticed, there was no mention of changing EPs during the session. I made a conscious decision before I started that I would use exclusively the 32mm EP. There are so many new combinations to now try on so many more targets that have now come within observational reach that I haven’t yet started tinkering with getting the best from each target. That will come in time. The weather forecast for this part of the country had continually predicted cloud to varying degrees all evening so I had no intention of going outside. When I did look up, I noticed the cloud was absent. Jupiter was shining bright. Orion had made good progress through the sky. A quick time check - 9.15pm. Excellent, the potential for a quick session and an early night. Within 15 minutes, the SBT was deployed and I was set up out the garden. I was really excited. Any other night, I would spend some quality time observing Jupiter. However, I'm afraid to say that last night, I served it injustice and merely used it for aligning the Telrad. However, I did have a quick glance. While I was there, I did a quick change of eyepieces down to 8mm. It was at this point, the scope started to struggle a little bit. I left it there for the time being, but will be back. Next on the list was the Orion Nebula. I could certainly see more of it in the SBT in comparison to the 150p. At least another 25% increase in nebulosity I would say. I sat there for about 10 minutes looking at it. With the SBT, I was able to observe in a seated position which is something that I struggle with the 150p on its EQ mount. I glanced up around the sky and noticed that Leo had risen high in the sky. I had intended on observing Leo weeks ago before the arrival of the SBT. I managed to pick out one or two things of note, but with many objects in the mag 9.0 sort of brightness, it was beyond the scopes capability at that point, and in those conditions. I made an attempt at M65 and M66. Bang! First time! I could see them clearly against the background of the slightly light polluted sky. Seeing wasn't brilliant but sufficient to confirm the target. This is when excitement really took hold. I m never usually one to rush through the targets, but I immediately started to wonder what else I could see with the SBT. Before I moved on, I gave first light to the 32mm 2" Panaview that I had also bought. This is an impressive EP and is very comfortable to use. Next on the list, I decide to look for M105. Bang! Straight there with the 32mm. But wait, not one galaxy, not 2, 3 but 4 targets easily distinguished all in the same field of view. I was confused, but a bit excited and wondered what I was looking at. I observed the targets for another 10 minutes or so through occasional periods of reduced visibility as some high level cloud whipped across the sky. I felt the best way to tackle this was to make a very basic sketch of the eyepiece. No particular detail, but the positions of the targets were mapped out. I could try and figure out what I had see when I got back indoors. Finally, I spotted the Pleiades in the sky behind me, so to finish the session of, I swung the SBT around and sat there in awe as the brightness of the cluster filled the eyepiece. This had to be the biggest and best view of the Pleiades I have ever had. I might even try to put more time into sketching it one night! So, that's a very quick update. I am hoping to get out again tonight because the forecast is much better again. I'll do a more thorough first light report of the new kit in the near future, but for now, I'm very happy! Not bad for an off the cuff unplanned first light session! Today, 20th March 2015, we, in the UK were subjected to a partial solar eclipse. In my part of the country, we had around 86% coverage. A while ago, I contacted my friend Jim to ask if he was interested in a joint observing session. We come to the conclusion that it would be worth organising, just leaving the location to be decided. The weather forecast this week has been changeable, but fortune favored us across mid wales, the borders and into the Midlands. Last night we decided that a good vantage point for the event would be the plateau car park near Hay Bluff in the Black Mountains. I arrived first and joined a few other people who were already there setting up ready for the partial eclipse to start. I took with me, my 150p reflector telescope and my home made solar filter along with the eyepiece case, DSLR and of course, Gelert the dog. I set the DSLR and telescope up so I could use prime focus photography through a x2 barlow. This give me an excellent field of view where the sun more than filled it. I also set up the GoPro camera to take a time lapse film of the event. I was hoping that it would capture the dip in light, but as it happened, unfortunately, very little can be detected. Once set up, I used my solar specs to keep an eye on progress whilst waiting for Jim to arrive. First contact was made by the moon and sun alignment which showed up quite well in the camera view finder. Also visible in this photo in the lower left corner of the from is a sunspot. Jim arrived and we caught up while maintaining a watch on the progress of the eclipse. From time to time we were also joined by other people who had come to see the eclipse and it was a pleasure to show them the view on the preview screen of the DSLR as the frames were being taken. The solar specs certainly did an excellent job giving a very crisp and clear view of the eclipse. As the eclipse progressed, the moon began to cover more and more of the suns surface. We weren't exactly sure what to expect in terms of changes to daylight etc. I knew that we wouldn't lose complete daylight due to the fact we were many hundred of miles from the path of totality. It was tricky to tell at first if the light of day was dimming. The human brain, and the function of the eye mean that we quickly adapt to subtle changes in levels of sunlight. In real terms, light levels probably dimmed more that we appreciated at the time. In the image above, the progress of the alignment can be seen nicely, again with the sunspot on the surface of the sun clearly visible. It was probably around this point in the eclipse that we could say that were certainly aware of a decrease in sunlight reaching our position. The sunspot getting close to the edge of the silhouette of the moon. The only real way of finding out about the true reduction of daylight would have been with the use of a light meter. Unfortunately, I don't have one of those in my box of gizmos but taking readings would have been interesting. Now we see that the sun spot is fully hidden from view. Locally, the weather had cooled quite dramatically. I should have taken a hat and gloves really, but there you go. As the eclipse progressed, I had to change the orientation of the DSLR in the focuser of the telescope to make sure I could fit as much of the image in the frame as possible. Here, we can see what has been referred to in some media outlets as the smile of the sun. This final image was about as close to totality as we could witness from our position. At this point, we were witnessing a definite drop in sunlight conditions, a drop in temperature and also the start of a cooling breeze. Whilst many people would report birds flying to trees to roost and the noise of bird song disappearing, we didn't witness that. Partly because there were no trees, but mainly because the actual level of daylight was probably similar to that of what you experience in a typical bad thunder storm. Bird song was heard throughout. This was one of the last images of the morning as the moon began to retract its silhouette from the sun. Overall, the experience of the eclipse was excellent and extremely memorable. It was a pleasure to share it with Jim and the other people who came by to pay us a visit. I will remember this for a very long time. Back in the eclipse of August 1999, I was working near Talgarth. Then, by some luck, I was given the day off so decided to view the eclipse from a location called Abes Mount. I took with me my battery radio and sat against a tree trunk, listening to the radio coverage coming from the Cornish coast. Back then, I didn't have any specialist viewing equipment, and truth be told, I think many people missed the event due to cloud. However, there was sufficient cloud to block out most of the sunlight and I was able to observe it naked eye. I counted myself very lucky. Many people were clouded out totally. That area of the Black Mountains is generally quite a special place, but events such as this make it more so. The SBT has landed, and weeks of rain are coming. This week, I've been dropping the odd comment here and there, and leaving semi cryptic clues on Facebook, about what I was expecting on Thursday. The story started at least 6 months ago, but came to fruition this week. Last weekend, we visited Tring Astronomy for a look in their showroom. I can't speak highly enough of the customer service and friendliness received from Neil and Jane at their showroom. I've been in email contact with them for a little while and have been very impressed so decided to fit in a visit to their showroom. About an hour later, we left the shop, and in my hand I had a receipt. 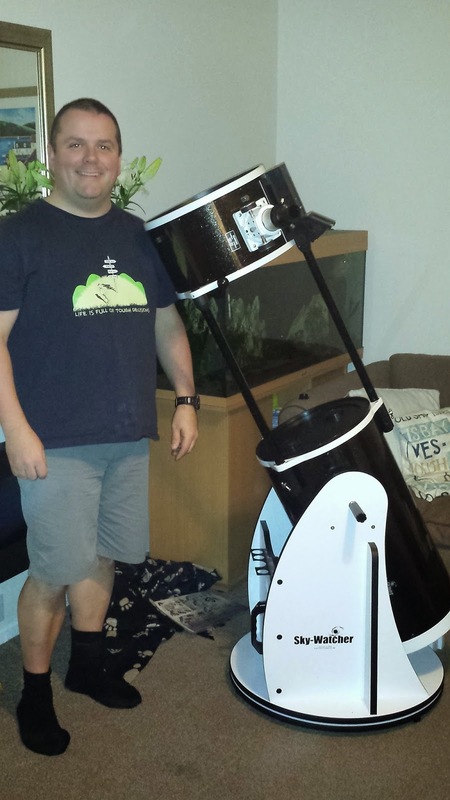 Thursday it arrived and here it is, the Skywatcher Flextube 300p Dobsonian telescope, or, as I have dubbed it, the SBT! My Slightly Bigger Telescope. This page gives a detailed look at the build process and the first impressions of it. And so, as the laws of astronomy dictate, anytime anyone buys anything exciting to do with astronomy, I am now condemned to at least two weeks of torrential rain and cloud! 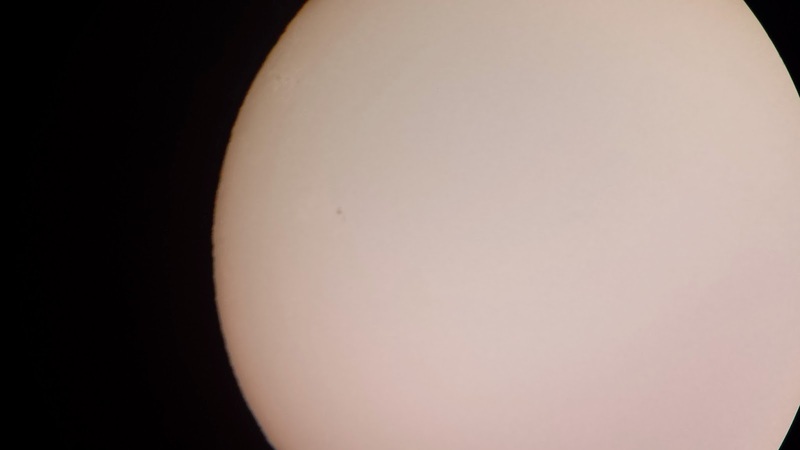 First light on the solar filter. Recently, in preparation for the coming partial solar eclipse, I have made my own solar filter. With the lighter evenings beginning to make an appearance, and with good weather forecast, I had the chance to try it out when I got home from work this evening. The sun was setting, and I reckon I had about 30 minutes before it disappeared behind the roofs of the nearby houses, so I set the tripod up and brought out the 150p. I put the new filter on the front of the scope and off we went. 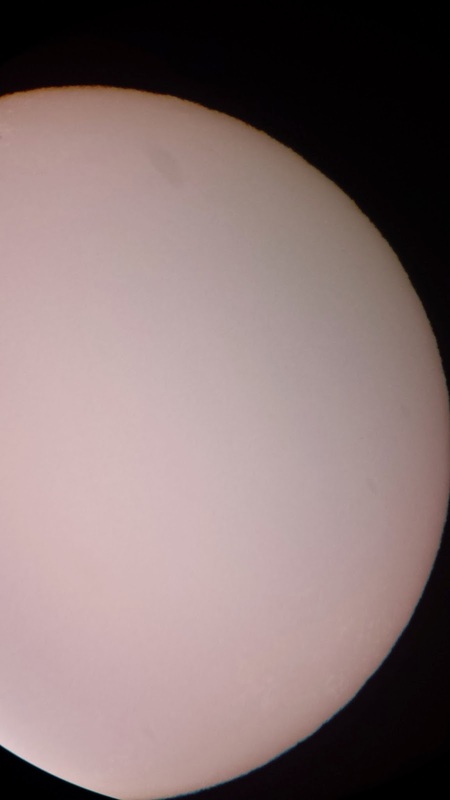 Firstly, I observed using the 25mm eyepiece which allowed me to see the whole of the sun with ease in the field of view. So, I swapped that eyepiece for the 12mm, and eventually the 5mm. I was really pleased with the results. The filter has done its job exactly as expected. Given that this was my first time that I have ever looked at the sun through my telescope, I was really pleased that I could make out some sun spots against the background of the suns light, and also another feature which looked like a bubbly cloudy mass near the edge of the visible sun. Time was precious before I lost site of the sun, so I decided to take a few quick photos of the view through the EP with the camera on the phone. The next time I have chance to observe the sun, I think I will attempt some simple sketching to record the activity on the suns surface. Hopefully, I will also try out the DSLR camera attached to the 150p to see what else I can pick up. All ready for the partial eclipse! The larger red circle was the area of activity on the surface of the sun visible through the UP. 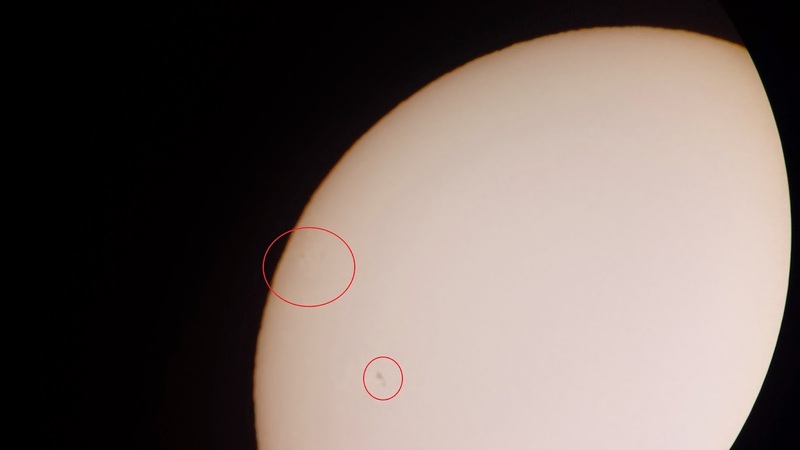 The smaller red circle shows the more apparent sunspots that were visible.